Best Photo & Video Apps For Social Posting — Monkey Fist | A Digital Marketing Co.
On Average, I create and post 950 individual pieces of content to social media channels each month. These posts are created for personal accounts, client accounts, and my own business accounts at Monkey Fist Digital. Social Media without visuals? I don’t think so. Apps make it easier to create engaging content. Posts with visuals are shared 2x as much over posts with only text. Why: Bright and cheerful. Excellent design and easy to use. I enjoy brighter whites abilities, their Instagram planning grid, and that the filter categories are named logically. Tips: Crop your photos first with their pre-crop grids. The app is so simple, I just brighten the photos, select a filter, and then 'just save'. The little house icon is, of course, the home/back button. Just remember to hit the little check mark after each adjustment to save. Why: A seemingly endless variety of photo collage possibilities. Easy to use and tell a story through photos. Tips: I use this app a lot for Instagram and Facebook. Remember less is more here. Using 5 or more photos looks cluttered, so keep it simple. You can edit photos as you add, but since it's a collage app, I like to create and export the collage to my photo album, open in another app to add an effect to the whole thing, then post to social. Why: A larger variety of pre-set crop measurements, larger color enhancements slider bars, and photo filters that make your photos pop. Tips: Clarify the photo, and then adjust the Highlights, Shadows, and Saturation before you add a filter. And, if you share a horizontal photo to (for example) Snapchat it will make it vertical which is not what you want. Best used for Facebook, Twitter, and LinkedIn. Why: As social media moves to more video you need to stay in the game. This app lets you splice frames together easily, add intro images, and you can create HD videos – all from your phone! Tips: Add a clip of video and then record yourself introducing the video. Throw in some theme music (all pulled from your phone), and you have a unique piece of visual content, that you can share your video right to social media. Why: A whimsical app to add pre-created graphics and text over photos which you can pull from any of your photo albums, Adobe Creative Cloud, and even Dropbox. Tips: Cropping images to ‘Square’ looks the best across all social platforms if you just want to make one image. When inserting a graphic, use the ‘Browse’ button to find the perfect graphic overlays for your branded content. Why: A quick and easy way to take edit your videos on the go. 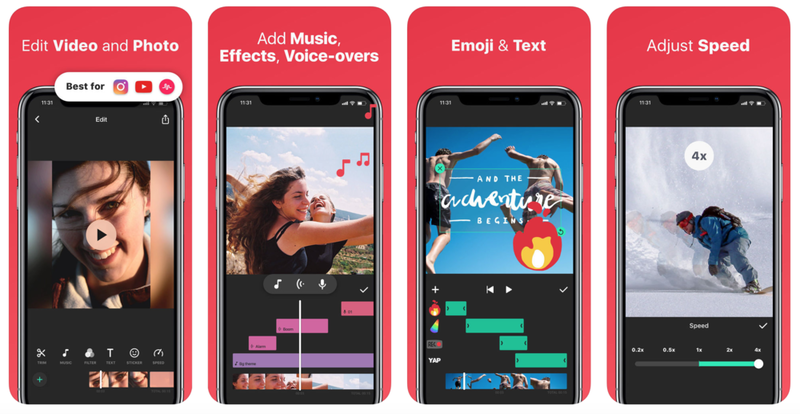 Tips: This powerful app has a lot of features including adding stickers and text to your videos. You need to drag your video, tell it when to stop, and then add those items - I kid you not I had to cut my nails off to make this work because it's so precise. And, when you make a video start by smiling and holding the pose for a second or two both at the beginning and then end so you have extra wiggle room to trim.